One of the great things about being a food blogger is belonging to a large, supportive and nurturing community. I have found the food blogging community to be such a great group of people – helping one another through issues (technical problems, marketing questions, working with brands, etc.) – everyone seems to jump to help one another. The community mourns together. And it celebrates exciting life moments just the same. Which is why Lisa and Marla put together an awesome virtual baby shower for Maria of Two Peas and Their Pod, who is expecting her first bundle of joy in just a few short weeks. Not surprisingly, the way food bloggers celebrate a virtual baby shower is by sharing some food! This pavlova is my contribution to the shower that is taking place across dozens of blogs today. Marla and Lisa were super stealth – they even sent all of us bloggers who are friends with Maria these super cute invitations. How fun! 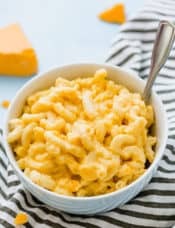 I admittedly haven’t been to many baby showers in my time (most of my friends are just getting around to that stage in life) but when I think of baby showers, I think of cute little bites, fresh flavors, and light textures. I racked my brain trying to think of a great dish to bring to the shower, and then it finally hit me – pavlova! It’s a dessert that I’ve always been intrigued by, but have never had the pleasure of making. The dessert was named after a Russian dancer, Anna Pavlova, to honor her while touring in either Australia or New Zealand (it has apparently been a source of contention between the two countries for years). 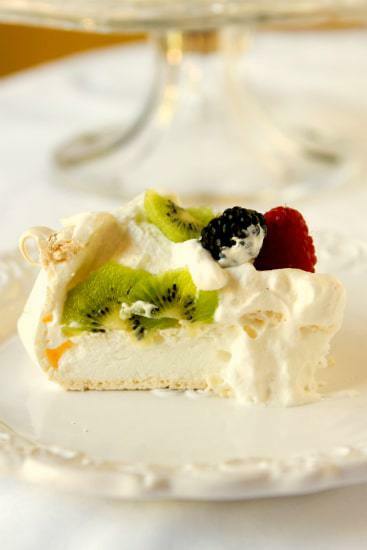 Pavlova is essentially a big pile of meringue that is baked up and topped with whipped cream and fresh fruit. 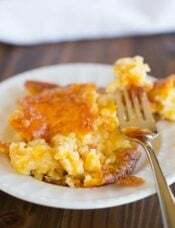 My good friend Beth actually sent me this recipe back at the beginning of the year for me to try (thank you Beth!). She figured I might want an authentic Aussie recipe for the dessert, and this comes from her friend’s mom (who is Australian). This is actually remarkably easy to make – you whip up egg whites into a stiff and glossy meringue and pile it into a circle. Bake it and let it cool, and then top it with fresh whipped cream and your favorite fruit. As it dries it will crack and dip and do all sorts of funny things – I love its character! It slices clean and pretty and has an incredibly light texture. I enlisted my sister as a taste tester and she said she wasn’t expecting to like it, but LOVED it. She said it was better than cake, and that she’s going to request it for her next birthday. Definitely a sign that something is a winner! Happy Baby Shower, Maria! I hope you enjoy the virtual display of food and are relaxing and getting ready for your little man! Congratulations! 1. Preheat the oven to 250 degrees F. Line a baking sheet with parchment paper and draw a 9-inch circle in the middle. Spray with non-stick cooking spray. 2. Using an electric mixer with the whisk attachment, beat the egg whites on medium-high speed until stiff peaks form. Add the granulated sugar and beat for 10 minutes, or until the sugar has dissolved. Add the cream of tartar and beat for one additional minute. Spoon the mixture onto the circle, and use a spatula to shape the egg white mixture into a circle with decorative sides, if desired. 3. 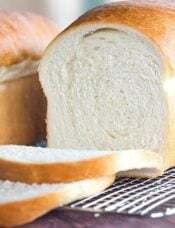 Bake for 1 hour, or until firm to the touch. Turn off the oven and prop the oven door open with a wooden spoon. Allow the pavolva to cool completely in the oven. 4. When ready to serve, beat the heavy cream on medium-high speed. 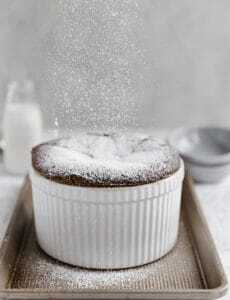 When the cream gets foamy, add the powdered sugar and vanilla extract. Continue to beat until soft peaks form. 5. 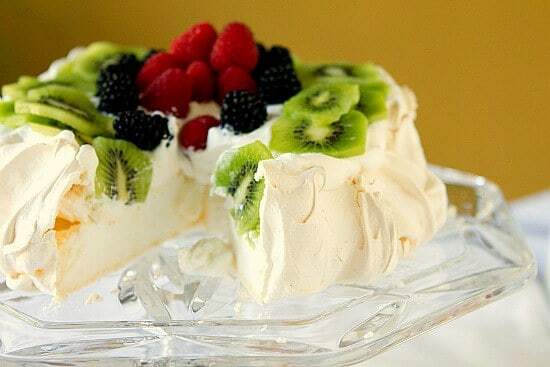 Transfer the pavlova to a serving plate. 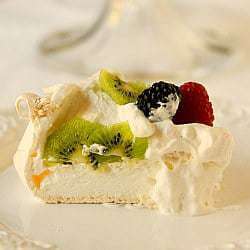 Top with the whipped cream and fresh fruit. I followed the direction of this to a T. My peaks were stiff and perfect, and then it all fell apart when I added the sugar. It never firmed up again. I beat it for over 30 minutes waiting on it to stiffen up again, and nothing. I ended up putting in a pie dish to bake, as it was the only way to keep it contained. It’s in the oven now, and frankly I’m not expecting much. Pretty disappointed. The Pavlova is from New Zealand, not Aussie!!! Good recipe all the same! Hi Angela, I would only keep it for a day before serving. Hi Michelle, I made the merengue base for this tonight and will frost it with the whipped cream tomorrow for my son’s birthday. So far, so good. 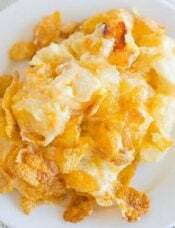 The egg whites whipped up very high and firm, I was very pleased. I ran the sugar through the Vitamix before adding it to the egg whites. 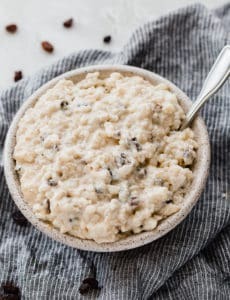 I know this recipe has been up for a while, but I just found it before Christmas, and we made it for our Christmas dessert. Hi Yelena, You really want to free-form a pavlova so that it develops that exterior crust. If it was runny, the egg white mixture likely wasn’t beat to stiff enough peaks. You should easily be able to shape the mixture with a spatula. Works amazingly in chocolate or coffee flavour! I made this dessert this weekend and it was delicious. Thanks to Alice for the tip about putting the sugar in the food processor first. I used the six leftover egg yolks to make lemon curd that was delicious with the fruit (raspberries , blueberries and strawberries). When I left my pavlova in the oven, it started to crack quite a bit. It didn’t affect the taste and I covered it with whip cream, but my question is how long should it cool in the oven to prevent cracking? Would using a bit of white vinegar( as suggested by Skye) help? Pavlova is such a stunning dessert! Your fruit combination is just perfect…as is this dish for a baby shower! This cake looks sooo good, and is pretty too. I’m for sure going to make this cake for next weekend. 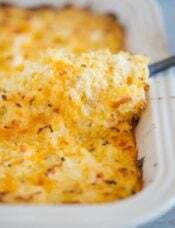 It sounds so easy to make and I’m sure my hubby will love it. That is absolutely the sweetest thing! 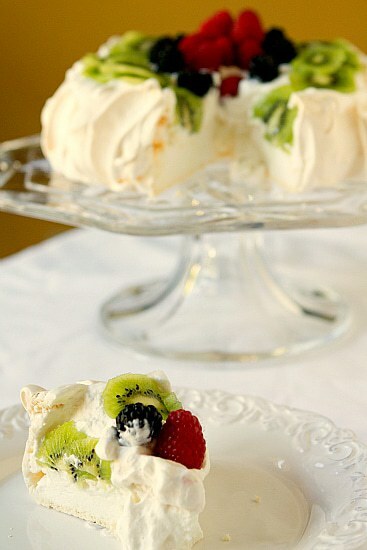 The pavlova looks delightful and Two Peas in a Pod is such a sweetheart! 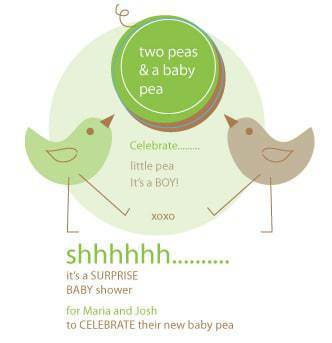 What a wonderful idea to have a virtual baby shower! The pavlova looks beautiful. And you are right…could you imagine the spread of all of this fabulous food in person!?! I’m going to make this beautiful dessert for a family get-together this weekend. It looks like the perfect ending to a meal of grilled beef tenderloin, my Bonefish grill salad, and your own green been casserole. A great use for some end-of-summer berries! Thanks for sharing. I love the cake stand! so elegant and a great set up for the pavlova. You DO take such nice pictures!!! 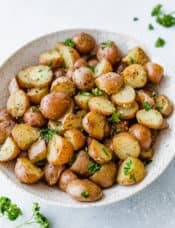 I hope I can try this recipe as soon as possible. such a pretty dessert for a lovely occasion! What a gorgeous looking pavlova! Your Pav looks fantastic. I’m a New Zealander (or a Kiwi as we known) and yes the contention between the countries as to who made up a Pav is a strong one BUT one which has finally been resolved when they found the oldest dated recipe ever…in NZ (so there you Aussies). The best thing about a Pav is that it doesn’t have to be perfect looking on top. You can flip it over or else cover the crater with cream. 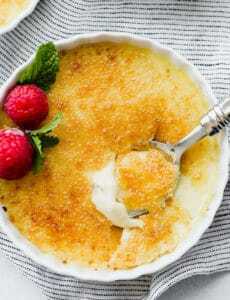 Although you can use any fruit you like on top, the favourites would have to be strawberries or passionfruit. Yoy can also make it in a swiss roll tin, fill it and roll it (like a chocolate log) as a yummy alternative for dessert. I always use castor sugar because it dissolves faster and I always add in a bit of white vinegar and a bit of cornflour to help to stabilise the egg whites so it holds its shape. 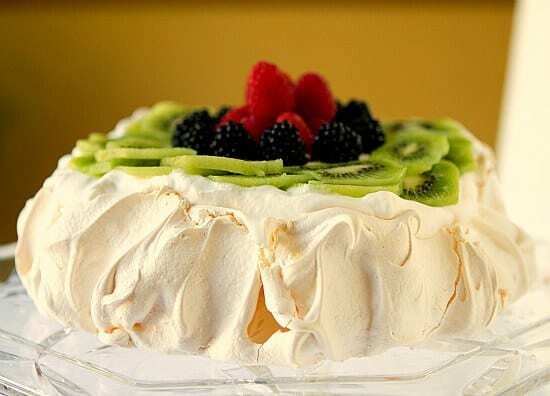 Your Pav looks absolutely delicious….maybe you have some Kiwi genes in there? I’ve always thought making pavlova would be terribly challenging but your recipe & instructions seem very attainable! Hi Mary, Yes that temperature is correct; pavlovas are baked at a low temperature for a fairly long amount of time (about an hour). Beautiful! What a lovely and perfect recipe for a shower, great job! What a perfect light dessert for a baby shower. This looks just beautiful and if I can get the meringue right very doable….I will have to try this! Yummm Pav’s are my favourite desert! So easy – and so delicious.